Long, long ago, there lived a huge crocodile in the river Ganges. The river flowed through a dense jungle. On both sides of the river there stood tall jamun and other fruit trees. In one such tree there lived a big monkey by the name of Raktamukha. He ate fruits from the tree and passed his days happily jumping from one tree to another. Sometimes, he climbed down the tree; took a bath in the river and rested for a while on its bank. One day, the crocodile came out of the river and sat under the big jamun tree in which the monkey lived. The monkey who was sitting high on a branch saw the crocodile taking rest under the tree. He became very eager to talk to the crocodile and cultivate a friendship with him. "Since you're taking rest under the tree", said the moneky, "you're my guest. It's my duty to offer you food." The monkey gave jamuns and other fruits to the crocodile to eat. The crocodile ate them and thanked the monkey for his hospitality. The monkey and the crocodile talked together for hours and soon they became friends. They developed such friendship that neither of the two was happy to miss each other's company even for a single day. Early since morning, the monkey would start looking for the crocodile, and the crocodile would also swim up to the jamun tree as early as possible. They would sit together, have a hearty chat and the monkey would offer him the delicious jamuns. This became their daily routine. One day, the monkey gave some fruits to the crocodile for his wife, as well. The crocodile took the fruits happily to his wife and also narrated the whole story to her. The next day, the crocodile's wife said to her husband, "Dear, if these fruits are so tasty, then the monkey who eats these fruits must be ten times more tasty. Why don't you bring the heart of this monkey for my meals?" The crocodile was shocked to hear these words from his wife. He said, "Darling, the monkey is my friend. It would not be fair to take his heart away from him." "That means, you don't love me", said the crocodile's wife and began to weep. "Don't weep, dear", said the crocodile. "I'll bring the monkey's heart for you." The crocodile swiftly swam to the other bank of the river and reached the tree where the monkey lived. "My wife and I invite you to our home for a dinner. My wife is very angry with me for not having invited you earlier," the crocodile said in a sad tone. "But how will I go with you?" asked the monkey. I don't know how to swim." "Don't worry", said the crocodile. "Just ride on my back. I'll take you to my house." 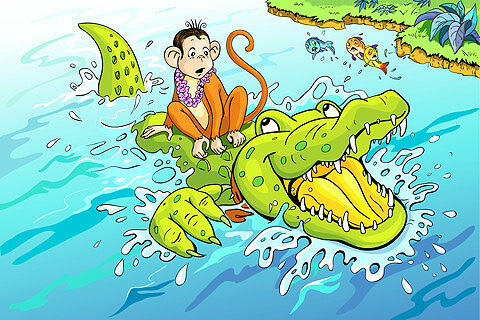 The monkey happily sat on the back of the crocodile and the crocodile started his journey in the water. While in mid stream, the monkey became frightened to see the water all around him and asked the crocodile to swim at a slow speed so that he did not fall into the river. The crocodile thought that he could reveal his real intentions to the monkey, since it was impossible for him to escape from the middle of the river. So he said to the monkey, I am taking you to my home to please my wife. She wants to eat your heart. She says that since you eat tasty fruits day and night, your heart must be ten times more tasty than those fruits." The monkey was taken aback to hear these words. He had never expected this type of a request from a friend. He kept his mental cool and said wittingly, "Very well friend. It would be my privilege to offer my heart to your charming wife. But alas! you didn't inform me earlier, otherwise, I'd have carried my heart with me. Which I usually keep in the hollow of the tree." "Oh!" said the crocodile, "I didn't think of it earlier. Now we'll have to go back to the tree." The crocodile turned and swam back to the bank of the river where the monkey lived. Upon reaching the bank the monkey jumped off the crocodile's back and quickly climbed up his home tree. The crocodile waited for hours together for the monkey to return carrying his heart. When the crocodile realised that the monkey was taking too long searching for his heart, he called him from the ground and said, "Friend, I believe, you must have found your heart by now. Now, please come down. My wife must be waiting for us and getting worried." But the monkey laughed and said sitting at the top of the tree, "My dear foolish friend. You've deceived me as a friend. Can any one take out his heart and keep that in a hollow. It was all a trick to save my life and teach a lesson to a treacherous friend like you. Now get lost." The crocodile returned home with his head bent down.